While I was in D.C. for the American Library Association’s conference I found myself caught up in one of those perennial debates that arise among readers. That is, do you skip to the end of a book? I’ve written about this topic before, when I was a featured writer for Tor.com. I here present my discussion and welcome your thoughts. Then I either go back to the novel or not. I decided to get responses from a few other people. My husband, Jim, had little to add. He never skips. Then I remembered my dear friend, David Weber. Back in the day when we both had time, we read each other’s manuscripts. I remembered being horrified to learn he read the endings early on. I thought I’d also check with his wife, Sharon, who is not only an avid reader, but is also a former bookstore manager. Weber’s response was that he does indeed skip, and tends to do so more and more now that his time is tighter. Sometimes he skips when the plot goes in an odd direction and he wonders if the writer can pull it off. Sometimes it’s just to see if the book will be a waste of energy: no closure or a contrivance that doesn’t suit his taste. Sharon usually doesn’t skip but, when she does, it’s because she is concerned about some character. She admitted that an experience with a historical novel she enjoyed, where if she’d skipped to the end she never would have finished, made her wary of skipping. Next, I tried my long-time pen-pal, Paul. He’s a reporter and enthusiastic reader. His wife, Maxine, an ombudsman for nursing homes, is also a dedicated reader. Paul said he rarely skips. Like Sharon, he was influenced by a bad experience that came from skipping. In his case, this was a final sentence that gave the whole plot away. Maxine does skip, but only “sometimes.” Her technique is to read “sideways” so as to get a sense of whether the ending is happy or not, without absorbing the details. Their good friends Kathy and Andy provided polar opposites. Andy, a mechanical engineer, never peeks. Kathy, however, did skip “occasionally,” mostly when she has gotten impatient with a book and wants to find out the ending. Trying to spread my informal survey out, I next asked another pen-pal, Scot, and his wife, Jane. I met Scot and Jane when we all worked on the Chronomaster computer game (he was assistant producer and director; she was art director). They now run their own web development company, so I thought they’d provide a good balance. Scot “occasionally” skips to the end, often because of concerns about the characters. However, this usually does not influence whether or not he’ll finish the book. He finishes “99%” of what he reads. Jane, however, joins the ranks of those who never skip to the end, in her case because she wants to experience the story in its entirety, and skipping would ruin that. Conclusions? Almost everyone skips. However, the reasons for doing so are widely varied. Unlike Ms. Crossen’s conclusion, few of these reasons have anything to do with the pacing. Only one person (Kathy) cited this specifically. Where do you fit in? Do you think skipping is “wrong” or a valid reading technique? I’m curious! This weekend I head off to D.C. to serve as a speaker at the American Library Association’s national conference. I’d be thrilled in any case (I really like libraries and librarians), but this trip has an added bonus. Washington D.C. is my hometown, the place where I was born and where I lived until I set off for college shortly before my eighteenth birthday. Growing up in D.C. was great. My folks (both born in the Midwest) never lost their delight about living surrounded by landmarks recognizable around the world. My dad worked first for the Department of the Interior, later for the Department of Justice. On those occasions we drove downtown to pick him up from work, Mom would keep us busy looking for various monuments, often telling us snippets about the various founders. Dad also got into the fun. He took us down to the Mall and the various branches of the Smithsonian often enough that we all came to feel they were “our” museums. We also frequented the National Zoo, visiting Smokey the Bear (who came from my new home state of New Mexico) and the other exotic animals. The first house I really remember well was a little townhouse in Georgetown. We moved from there when I was seven to an enormous fixer-upper on Brandywine Street between Connecticut Avenue and Rock Creek Park. In addition to the usual fittings, this house had something like seven bedrooms, four full bathrooms (and two half-bathrooms), a library, a dining room large enough to sit fourteen for dinner without a strain, a living room so big it swallowed furniture, and other flourishes (butler’s pantry, servants’ staircase, antique crystal chandeliers). Upkeep and renovation on that house was a constant work in progress for my folks. I remember it was a hugely expensive to heat, but it was a wonderful place for a high-spirited family. The proximity to Rock Creek Park was also great. The creek was at the bottom of our street (you had to cross the parkway to get to it, but we’d run fast). We’d go there to splash around, catch crayfish and minnows, and climb the hills. I suppose I should mention that in this area nothing was flat. We all had calf-muscles like professional athletes just from walking in our own neighborhood. Even the driveway was a major workout. Summers we went out to a little cottage on the Chesapeake, but that location was so important that I’ll save it for another time. I got used to explaining the history of the federal city to any and all who would hold still long enough to listen, but the cap for this long comic routine came when I was twenty-six and finally got around to getting a driver’s license. One of my college roommates (and still friend), Kathy Curran, had been kind enough to drive me to Motor Vehicles. There we stood in this massive room, lines stretching ten or twenty in each direction, people of all shapes, sizes, and colors, speaking dozens of languages all waiting to get their paperwork approved. When I hit the top of the line and presented my birth certificate, the woman glanced at it and looked puzzled. Well, Madge came over and we worked it out, but not before Kathy (who had taken part in her share of the “not a citizen” routines) nearly doubled over trying not to show how hard she was laughing. Living in D.C. was wonderful in many ways, but it had its down sides as well. For one, we didn’t have a lot of things that people born in “real” states take for granted – like voting Congressional representation or having the option of “in state” tuition for college. Here in New Mexico, where the population is so small, I really appreciate both being able to vote and that my vote counts. And I remind those who gripe about our local colleges how lucky they are to have them at all. And as an ironic closer, I have chosen as my new home a state that many people don’t realize is a part of the United States. From a city that made me forever not a citizen to a state that doesn’t exist… There’s an odd synchronicity here or maybe I’m just destined to always be a bit of an outsider. Sunday morning, our phone rings. It’s our good friend, Yvonne, offering us two free tickets to a bead show. I have a tremendous weakness for beads. Jim likes them himself, which makes such an event fun for us both. When we arrived at this particular show, we discover that most of the beads are chunky. This isn’t a bad thing in and of itself, but I will admit a preference for seed beads and those slightly larger. Probably this preference has its roots in my earliest ventures into beading. When I was relatively young, my mom taught me how to make Christmas decorations by stitching sequins and beads onto felt. This was a perfect project for a child. Unlike many fabrics, felt doesn’t need to be hemmed, so there is no fussy finishing work. Stitching a seed bead into a sequin offers immediate gratification as sequin and bead catch the light and become more sparkly than either are alone. My childhood fondness for beads never vanished, but it wouldn’t be until college that I would begin to try more elaborate beading projects. I learned how to make brick stitch earrings. Later, in a dusty corner of a toy and craft shop on the Grand Concourse in the Bronx, I found a small bead loom. I did a lot of narrow beaded strips, but never did much with these beyond sticking them in an old jewelry box. Eventually, both my growing income and my greater mobility let me try other beading projects. I did counted cross-stitch beading projects starting with kits from Mill Hill and graduating to my own patterns. I’d always liked woven beadwork, but, frankly, I hate stringing the loom. With the excellent instructions in Suzanne Cooper’s Dancing Light, I taught myself to do even count tubular peyote stitch. I’ve done quite a few amulet bags using this technique. If you’re interested in seeing one, take a look at the FAQ page on my website (www.janelindskold.com). This wolf was one of the most complicated patterns I’ve done. There’s a tiger in the same book (Wild Things by Valerie Hixon) where I found the wolf that I dream of finding time to do. (Looking at the FAQ page, I see I need to update the first two parts. I’m done with the Golden Reflections story; it’s called “Like the Rain.” Now I’m working on red penciling my novel Sundial Ring. However, that’s about to change, so I think I’ll wait a few days to do the update). I also have done some free-form beading. 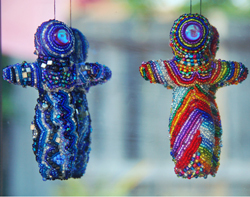 The picture illustrating this is of two small dolls I beaded. They’re only about four inches tall but quite heavy because of the number of beads. Their names are Storm and Rainbow. Occasionally, I do work in larger sizes. I’ve strung a choker from semi-precious polished stones on tiger tail wire. I’ve made bead strands interspersed with magnetic beads; these can be worn as necklaces or bracelets. I’ve made a wide variety of earrings. I’ve also done bracelets strung on elastic. When my niece Rebecca was five I made her a huge number of necklaces from plastic pony beads strung on hemp twine, so she could adorn herself with relatively indestructible beauty. But I think seed beads and their tiny relatives remain my favorites. At this weekend’s bead show I got a line on a store here in town that has the best selection of seed beads I’ve ever seen, including a complete line of delicas. Jim bought me the beads I need to do a fabulous Eye of Horus design from Suzanne Cooper’s Adorn Yourself. Then when I’ve gotten back into the swing, well, maybe I’m fated to do that tiger after all. Standing upon a seawall, rust-encrusted rails on all sides, surf crashing oceanwards. Holiday humans, Sunday humans surround us, tightly packed, surprisingly silent except for murmurs of delight. We share flashes of smiles, a word or two. Below us, on the sheltered side of the seawall, baby sea lions are sheltered. We humans watch them, muted perhaps by the sound of the waves, perhaps by our own wonder and pleasure. The baby sea lions haven’t noticed us. They hardly notice the sea gulls above the kelp line on the sand. The baby sea lions notice waves. Some haul themselves onto the slick wet rock almost out of reach. There is a place in the rock like a cradle, just large enough to hold one fat pup. A pup sleeps there, rocked back and forth by the water. 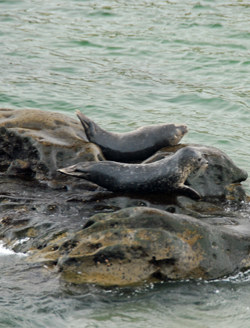 One of its creche-mates struggles onto a higher spot on the rock, flippers cradle-sleeper in the head. The sleeper stirs restlessly, as it had not when the waves had covered it. At the edge of the worlds where water meets sand, two other pups, bolder, or perhaps merely less drowsy, align themselves in careful parallel with the waves. When the wave comes in, they’re rolled up and down, below the water. Like us on the wall, they are silent, but we feel their delight as if they squealed it aloud. The air smells strongly of drying kelp. Of sea gull. Perhaps of wet sea lion. I have no idea. I am lost in the wet pleasure of waves and baby sea lions. As I write this, Jim’s out in the yard flintknapping. That is, he’s making arrowheads. I think this one is out of blue glass. Jim primarily works in obsidian (a natural glass), but he enjoys the colors in manufactured glass and plays with that as well. 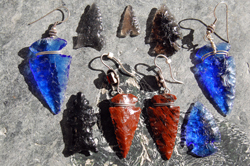 Pictured are Mexican obsidian, mahogany obsidian, and blue glass. People often ask me what it’s like being married to an archeologist. Well, I can’t say in general, but I can say that this particular archeologist is pretty fascinating. Jim is a senior project director for the Museum of New Mexico, working within the Department of Cultural Affairs. His job embraces a wide range of duties and skills, ranging from the physically demanding to the highly intellectual. He not only needs to be able to work outdoors in the punishing conditions of our New Mexico weather, but also to be familiar with the most cutting edge theories of his profession. In addition, he also does laboratory analysis, and trains newcomers in skills that range from lithic analysis to how to shovel without doing yourself damage. Oh, and he has to write budgets, too. And it doesn’t hurt that he knows how to make arrowheads. Why this last you might ask? Well, one of Jim’s specializations is lithic analysis – that is, analysis of stone tools including arrowheads, knives, scrapers, gunflints, and the related detritus. Contrary to what television and movies may have led you to believe, artifacts are rarely found intact. In fact, in the case of lithics, it is much more usual to find the detritus associated with the creation of the artifact than the artifact itself. In the years that Jim has practiced flintknapping, he has learned first hand what that detritus means. He can often tell whether a specific flake indicates a skilled worker, a novice, or merely someone in a hurry. He can look at a partially finished piece and tell you why it wasn’t competed. Not always, he wants me to assure you, but a lot of the time. That reminds me of a funny thing that happened a few years after we got together. Jim’s office had two young hotshots who were training in lithics with Jim. Their assignment was to analyze the lithic assemblage from a particular site, making conclusions about materials, type of flakes, and stuff like that. Because they were in training, Jim was checking their work. I guess they figured that maybe Jim didn’t know as much as he thought he did. Maybe they were just feeling their oats. For whatever reason, these two young men came into Jim’s office all serious and presented him with a piece of stone. Jim accepted the artifact in question, swung around to his microscope, and inspected the artifact. Two faces shifted from serious to astonished. Guess what? That’s just what they had done. Jim’s pretty cool in other ways, too. I’ve seen him down in a hole that’s nine feet deep – an Ancient Puebloan (or to use the now outdated term “Anasazi”) pithouse – tossing out shovels of dirt and, without looking, hit squarely in the center of a wheelbarrow that’s another three feet up. I’ve watched him present academic paper at invitation-only seminars, then be complimented for his scholarship by the people who were once his professors. In fact, Jim has more publications than most writers I know – and that includes me. And I’ve watched him talking with a law officer who has stopped by his site to ask for advice about some bones that have just been found where a flash flood washed out a dirt road. I’ve seen him listen patiently while a tourist who has read precisely one article on Southwestern archeology holds forth as if she’s an expert. This summer, Jim has a project going into the field. I’ve volunteered for him before (usually taking notes in order to free up someone who is more skilled). I’m already setting aside time to go and volunteer on this one. What’s it like being married to an archeologist? I can’t say in general, but I can say that being married to this one is pretty cool.